The good news: his eczema is gone. The bad news: he is fed up with the endless rice flour wraps and almond milk smoothies and has started to sneak verboten foods before we have had a chance to determine which one was causing his eczema. !! Curses!! 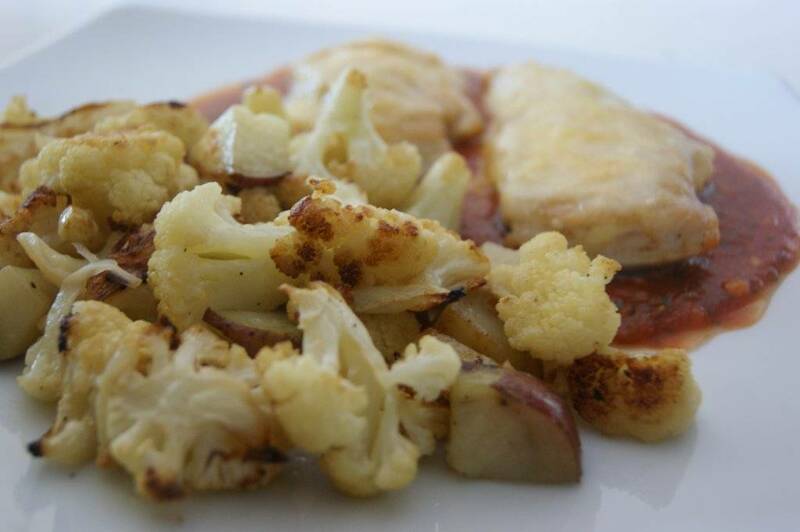 To keep him in the fold and jazz up the special diet a little (and because, quite frankly, we are all sick of gluten-free pasta) I recently played around with one of his favourite meals, Chicken Parmesan, subbing in roasted cauliflower and potatoes for the pasta. And, folks, it was a winner! Not exactly traditional, but so very, very tasty. Chicken Parmesan, for those who don’t know, is basically like a cheese pizza with crispy breaded chicken cutlets standing in for the crust. I had not bothered to make it while we were on the no-ingredient diet because, well, what was the point? No pasta or parmesan allowed, and no flour, eggs, or crumbs for the breading. ?? 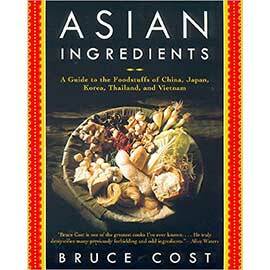 I’m not generally a fan of trying to use “no ingredients” to replicate traditional dishes. I’d rather move onto a different cuisine altogether, say, delicious Thai rice noodles or creamy South Indian coconut curry. But I get it. We all want our comfort foods. I am willing to play around in the kitchen for the team. So the Chicken Parmesan with cauliflower was so good that I have made it twice more since. I’ve dispensed with the chicken breading altogether (I may have been able to find some decent gluten-free crumbs, but with no eggs to help them adhere to the chicken? I’m not in the mood to deal). Instead, browning the seasoned cutlets nicely in clarified butter worked like a charm. But the real charmer here is the bed of roasted cauliflower. Roasted cauliflower is really, really good. Like, to die for. Nutty and succulent rather than watery and sulfurous, it’s one of my favourite vegetable preparations. And it tastes WAY better than pasta with fresh tomato sauce! It has flavour and personality of its own, whereas pasta is kind of a bland vehicle for the sauce. 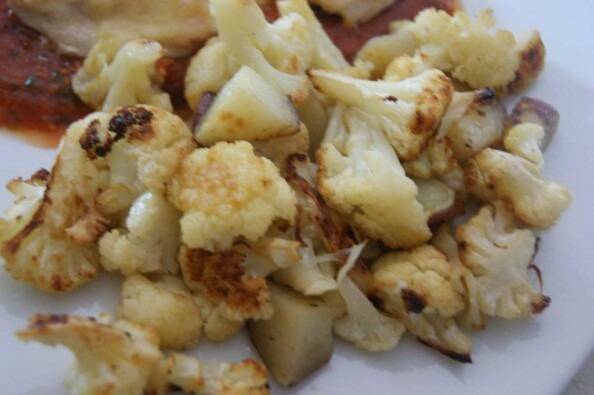 Roasted cauliflower for the win! 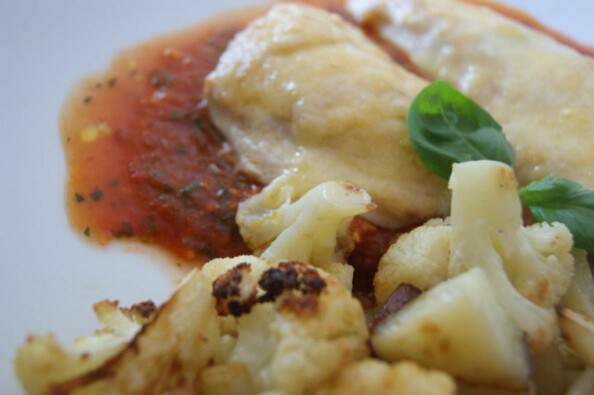 As it frequently seems to happen around here, I posted about how much I loved the roasted cauliflower version of chicken Parmesan on my facebook page, and many fans immediately asked me to blog the recipe. So here it is, for my fans! A delicious gluten-free alternative to the traditional dish. Leftover tomato sauce makes a excellent base for pizza, pasta sauce or minestrone. Preheat oven to 450 F. Line a large baking sheet with parchment paper. Remove the leaves and core from the cauliflower and cut cauliflower into 1- to 1-1/2-inch florets. Place in a large bowl. Cut potatoes into small cubes, about 3/4-inch square. (You want them to be smaller than the cauliflower because they take longer to cook.) Place potatoes in the bowl with the cauliflower. Sprinkle the salt all over. Melt clarified butter and pour over the vegetables. Toss to coat evenly with salt and butter. 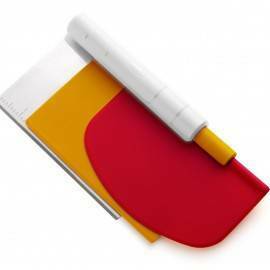 Pour vegetables onto the parchment-lined tray; spread out into a single layer. Place in the oven to cook. They will take about 45 minutes, and you will need to rotate the pan front to back, and possibly stir the vegetables once, while they are cooking. When done, the cauliflower will have golden spots ranging from pale to dark. Meanwhile, prepare the tomato sauce. Dump the tomatoes, juice and all, into a blender or food processor and pulse to make a coarse puree. In a saucepan, combine two tablespoons of the olive oil with the minced garlic, the chopped rosemary and the red chile flakes. 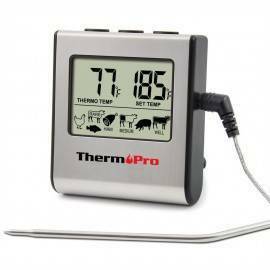 Heat gently until the garlic starts to sizzle and let cook for about 20 seconds. Add half of the fresh parley and basil. Sauté for about 30 to 60 seconds, until fragrant, then add the tomatoes and ½ tsp salt. Let simmer for about 5-8 minutes, until fragrant. Remove from heat and set aside. Meanwhile, prepare chicken. 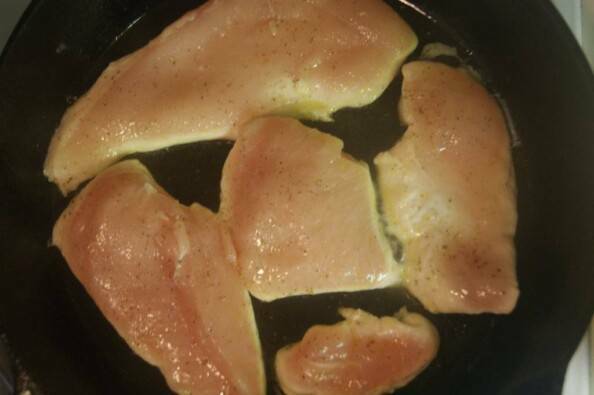 Lay a chicken breast flat on the cutting board. If the tender is still attached, remove it. Now slice through the chicken breast widthwise to make two thinner cutlets (kind of like slicing a bagel in half). A good image of slicing chicken cutlets is found here. Sometimes the second piece is the right thickness, but not as long as the first. That’s fine. Make sure your cheese is grated, mixed together, and ready to go. Heat two cast iron or heavy saute pans over medium-high heat for several minutes. Have a baking sheet (with sides) ready. Add half of the clarified butter (or olive oil) to each pan. Lay in the chicken cutlets without touching. Sprinkle cutlets generously with salt and pepper. Cook, without moving, for about 3 minutes, until golden brown on the bottom. Flip each piece of chicken and cook about 2 to 3 minutes more, until chicken is golden on both sides and just cooked through. Transfer chicken to the baking sheet. Sprinkle the the cutlets evenly with the grated cheese mixture to cover. 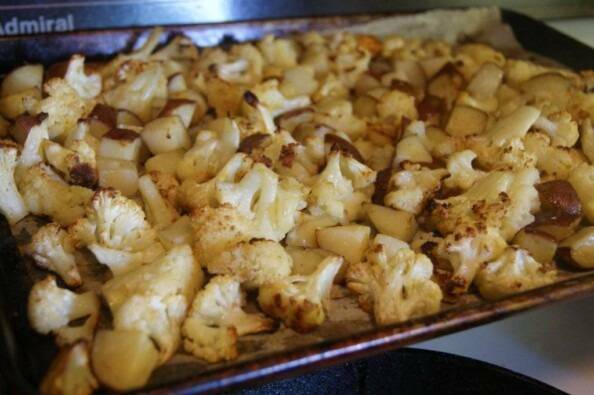 When the cauliflower-potato mix is done, remove from the oven and set aside to keep warm for a few minutes. Move oven rack up to top position and turn your oven’s broiler on high. 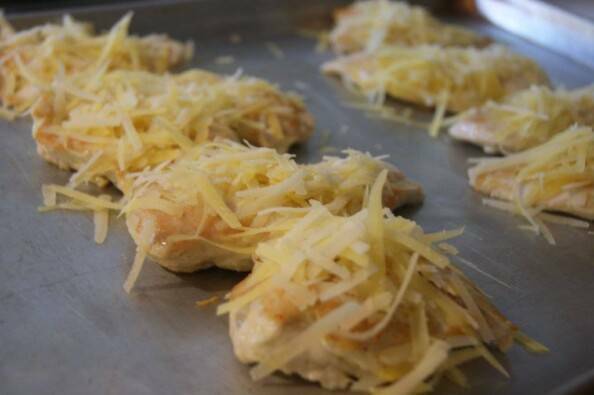 Once the broiler is heated, place the trayed and cheese-covered chicken on the top rack under the broiler and broil until cheese is melted and bubbly. Meanwhile, return the tomato sauce to the heat and heat gently. Stir in remaining parsley and basil and remaining 2 tablespoons of extra virgin olive; taste to adjust seasoning. The sauce may need more salt or a touch of sugar. 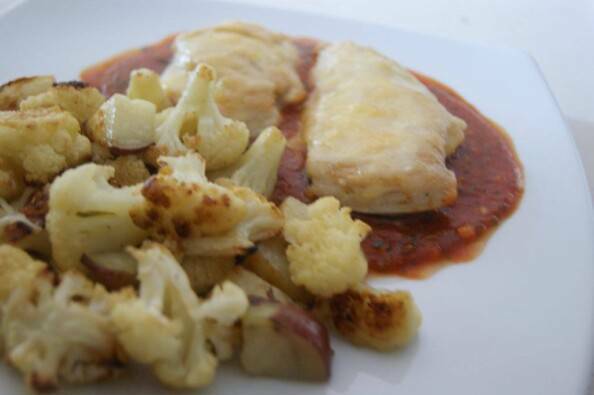 To serve: pile some cauliflower-potato mix in the center of the plate, cover with a scoop of tomato sauce and top with a cutlet of broiled cheesy chicken. Or plate as I have done in the photo, with the cauliflower on the side and the chicken-topped tomato sauce next to it. 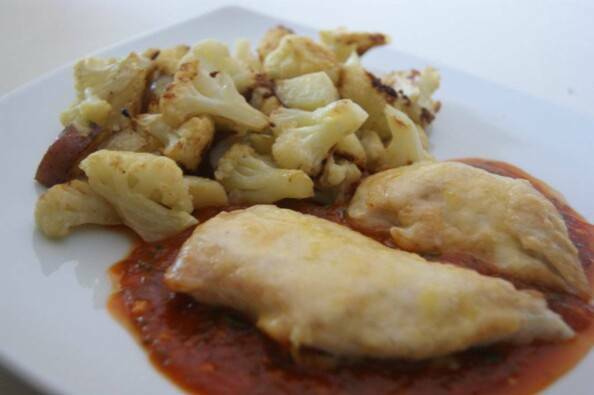 Mix sauce with cauliflower and/or chicken as you eat. Also, feel free to add more grated cheese over top of the whole thing, if that’s how you roll. Oh thanks a lot for this yummy recipe. I’m in a similar situation and am trying to jazz up my little one’s diet. She is 6 and it’s a bit tough to find the right gluten-free diet to satisfy her taste buds. ‘Chicken parmesan on a bed of cauliflower’ would be great for her.